Spinr Magazine 002 features Electronic DJ and Producer Zedd (cover) interview with him talking about his recent Album Release 'Clarity', his music and working with Justin Bieber, Lady Gaga and more. 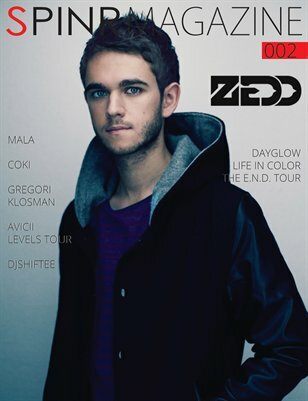 Also featuring interviews with DJ Shiftee as well as coverage of Mala, Coki, Avicii Levels Tour, Gregori Klosman US Tour and Dayglow Life In Color The E.N.D. Tour.